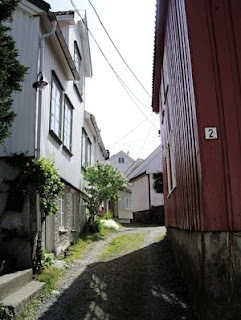 During summer I love to stay in Arendal, the place I was born and spent 19 years of my life. Arendal is the administrative centre of Aust-Agder county on the southern coast of Norway. If you want to travel to Norway this is the area where you are likely to have the best weather during your stay. 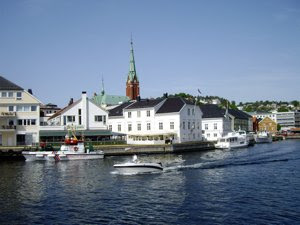 The area around Arendal have in average the highest number of sunny days during the year of the entire country. I love the place I was born. The city was first mentioned in 1528, and grew during the 18th century into one of the largest commercial centres in Scandinavia. During its peak, more than 600 sail ships belonged to the wealthy families in the city. The area has a rich cultural, architectural and historical heritage. As the city throughout its history was built in wood several fires ravaged the historic city centre, but there are buildings that escaped the flames. 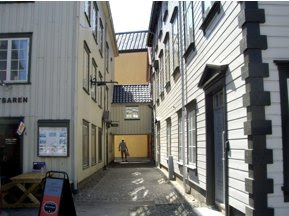 The main historic district is Tyholmen, a peninsula that survived the fires, but were threatened by urban planners in the 1960s. 40 years ago protests from the citizens of Arendal stopped plans to demolish the entire historic district as the politicians wanted a modern city centre. Now the old buildings here have been brought back to its former glory to house galleries, small shops, restaurants, and flats. The oldest houses here may be as old as 400 years. At that time there were islands where you today find streets and squares. In fact Arendal was called the Venice of the north, due to the fact that there were channels rather than streets that separated the houses. Pollen, the old harbour, is the only remains of the old channel system. On the left you have Langbrygga - the long quay that burnt down during the last fire in 1868 and was rebuilt in bricks, on the right side you see houses built in the late 17th and early 18th century and the 82 meter high tower of Trefoldighetskirken (Trinity Church) that was built at the peak of the city's wealth in the 1880s. During summer there is a hectic life here and you find speedboats, yachts and traditional wooden boats side by side. One of my favourite past times is to sit here and eat freshly boiled shrimps out of a paper bag and look at the hectic life. Or you may visit the market square, once the place where you could buy fresh produce from the areas around the city. The tradition is still alive as you can buy fresh flowers and vegetables here, and there are farmers markets regularly where you can buy specialties produced in the area. The yellow house on your left is Bondeheimen, the only house that survived one of the large fires and it dates back to the 18th century. 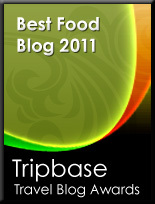 When I was a kid, we often went here to eat at the local tavern that served traditional Norwegian food. Sadly it is now gone. The city has not entirely escaped urban planners, but lately new architecture of a high standard has made the city more beautiful, than more ugly. The new culture centre is a good example of this. 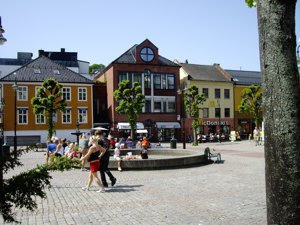 The largest square of Arendal was the location of its bus terminal. On this square you found a six floor building. The urban planners proposed to tear the office building down, and build a brand new cultural centre here, and succeeded. Today you find this example of beautiful contemporary architecture here and a large shopping mall was built on what used to be a parking area. The latter has brought the customer back to the city centre, as it was slowly dying out due to the construction of a large shopping mall (or shopping area) at Stoa. 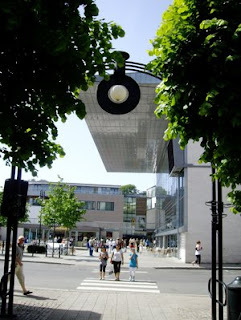 The mall has once again made Arendal city centre a place for shopping. If you want to see another area that might give you an impression of what old Arendal once looked like, I recommend the old area at Barbu bukt, a bay east of the centre. 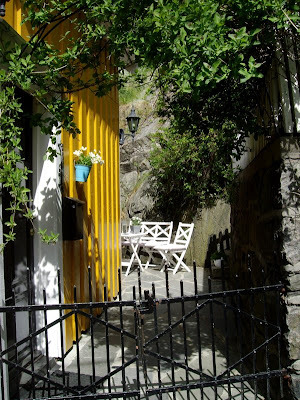 Lykkensborgveien and Hulveien are two old narrow streets with wooden houses from the 18th, 19th and 20th century in beautiful harmony. The history here goes back to the late 1500s. I have heard a story that Jens Munk, the famous explorer, was born in one of these houses in 1579. I have not been able to verify the story or do not know in which house he was born. What we do know is that he was born at Barbu. I love my city, and I do recommend a stay here during summer. There are so much to do in the city and the area around. An English friend of my sister once described it as the Provence of the north and I do agree. 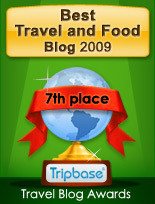 This is the place to stay from June to August. You may enjoy the world during the rest of the year. Grand Hotel des Terreaux - recommended!! Delivered to you every morning at 8 o’clock!